This text is for courses that are typically called (Introductory) Differential Equations, (Introductory) Partial Differential Equations, Applied Mathematics, Fourier Series and Boundary Value Problems. 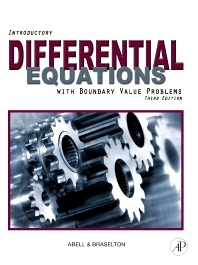 The text is appropriate for two semester courses: the first typically emphasizes ordinary differential equations and their applications while the second emphasizes special techniques (like Laplace transforms) and partial differential equations. The texts follows a "traditional" curriculum and takes the "traditional" (rather than "dynamical systems") approach. Introductory Differential Equations is a text that follows a traditional approach and is appropriate for a first course in ordinary differential equations (including Laplace transforms) and a second course in Fourier series and boundary value problems. Note that some schools might prefer to move the Laplace transform material to the second course, which is why we have placed the chapter on Laplace transforms in its location in the text. Ancillaries like Differential Equations with Mathematica and/or Differential Equations with Maple would be recommended and/or required ancillaries depending on the school, course, or instructor.